American astronauts Douglas Wheelock (left), Shannon Walker (center) and Scott Kelly record a Thanksgiving holiday video message from their home on the International Space Station on Nov. 23, 2010. Americans on Earth areexcited about the holiday of Thanksgiving. Astronauts in space are too, butthey'll hold the famous turkey day early because of some holiday travel ? atrip back to Earth. The station's three Americanastronauts will host a space Thanksgiving for their three Russian crewmates today(Nov. 24) ? a day earlier than the actual holiday ? to give them one last bigmeal together before half of the crew returns to Earth Thursday night. The U.S.-Russian crew willgather together tomorrow in the stations' aptly named Unity module for their Thanksgivingin space. The idea for the early celebration came from NASA astronaut ScottKelly, who will take command of the station tomorrow, NASA officials toldSPACE.com. 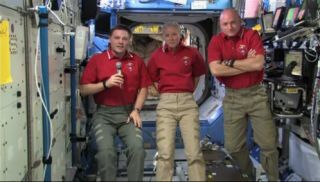 "I'd like to wisheveryone a very happy, happy Thanksgiving," Kelly said in a holiday videomessage, adding that he and his crewmates were thankful to be on the station. "I'm thankful and I feel privileged that I was born and grew up in acountry that could be a major contributor to something as magnificent as theInternational Space Station." When it comes to a spaceThanksgiving meal, astronauts have traditionally feasted on traditionalholiday fare ... but with a NASA twist. NASA also has a recipefor space cornbread dressing available for the public to try out. Kelly will be saying farewellto American crewmates Douglas Wheelock and Shannon Walker, as well as cosmonautFyodor Yurchikhin, when they depart the space station late Thursday on aRussian Soyuz capsule and land on the steppes of Kazakhstan in Central Asia,where the local time will actually be Friday morning. The trio has been livingon the space station since mid-June. "I'm just thankful to be here and be part of this crew," Wheelocksaid. "It's been a tremendous experience for us." It's somewhat unusual for aspace station crew to celebrate a U.S. holiday early, but Kelly asked for sometime in the schedule because the astronauts and cosmonauts will put in a fullday's work Thursday when most Americans are sitting down to a traditionalThanksgiving meal. "It's not the normalapproach," NASA spokesperson Nicole Cloutier-Lemasters said. "I thinkthey're doing it in this case to accommodate the Soyuz landing." Wheelock, Walker andYurchikhin plan to undock their Soyuz spacecraft from the space station at 8:22p.m. EST (0122 GMT) Thursday ? Thanksgiving night in the United States ? aheadof a planned 11:46 p.m. EST (0446 Nov. 25 GMT) landing in Kazakhstan. After landing, the returningstation crew will be retrieved by a recovery team and flown to Kustanai,Kazakhstan. From there, Yurchikhin will return to Russia's Federal Space Agencyheadquarters in Moscow while Wheelock and Walker return to NASA's astronautheadquarters at the Johnson Space Center in Houston. Wheelock and Walker shouldreturn home to the United States on Friday, Cloutier-Lemasters said. But astronauts won't have towait until their Houston arrival to taste their Thanksgiving turkey. "Some Thanksgiving foodwill be on the NASA plane for them to eat en route home," NASA spokesmanRob Navias told SPACE.com in an e-mail.